Saint John of Capistrano … was an extraordinary survivor of an earlier period of Medieval crusading (the likes of which was not seen again in Europe until the siege of Vienna in 1683). John of Capistrano, whose imposing bust still adorns the main facade of Saint Stephen’s Dom in Vienna, certainly looked the part of a Peter the Hermit, the crusading leader of the eleventh century. Small of stature, with an emaciated frame, hollow cheeks, deep-set eyes, and parched skin, he had the countenance and stature of a mystic as he gathered the faithful around him in the city of Györ in Hungary and preached the crusade to the common man in Latin. No one understood his exact words, but the tone of the message was unmistakable as he thundered: “God wills it that we chase the Turks out of Europe and for whosoever follows me, I will obtain plenary indulgence for him and his family.” It was more a matter of heart than rational thinking that induced a ragtag army of some 8,000 inexperienced and poorly equipped peasants, lower burghers, students, and clergymen to follow John on his southeastward march. They had gathered all the crude weapons they could assemble: slings, cudgels, scythes, pitchforks, stakes, and other farm implements. It was, however, their determination and fanaticism that proved more than a match for the holy war proclaimed by the sultan and the tried military talent of the Turks and janissaries. The generals and the diplomats who attended John’s demagogic harangue at Györ — Hunyadi, his son László, János Vitéz, Vlad Dracula, even Pope Calixtus III‘s legate, Juan Cardinal de Carvajal — were not impressed by what they regarded as a “mob.” In the end, though, these leaders found they had underestimated the power of faith to move men. At a meeting summoned by Hunyadi at Hunedoara on January 13, 1456 [three years after the fall of Constantinople], basic strategies for the impending campaign were laid out and assignments to the military leaders given with little reference to John of Capistrano’s crusaders, who worked essentially as an independent force. 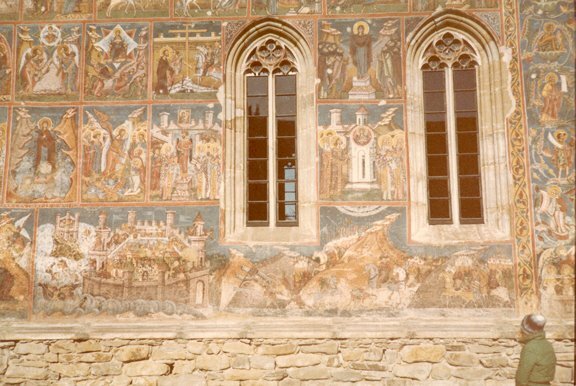 Dracula, with an army composed mostly of Romanian mercenaries, was instructed by Hunyadi to stay at Sibiu and watch the Transylvanian passes. In addition, his young protégé was given to understand that he could proceed with the offensive against Vladislav II at whatever time he would deem appropriate, thus to relieve pressure at Belgrade by compelling the Turks to keep a body of troops on the Danube. In essence, Dracula’s mission was part of the overall strategy in protecting the eastern flank of the Belgrade defensive operation. In turn, Dracula’s cousin Stephen of Moldavia, also in Hunyadi’s entourage, was waiting for an opportunity to overthrow the other Turkish vassal, Petru III Aaron. By June 1456, in the words of the historian János Thuróczi “as the grain began to ripen, a vast army, accompanied by 300 siege guns and 27 enormous cannons, followed by the fleet on the Danube, moved northward, capturing on the way a number of Serbian cities that had maintained a precarious autonomy under Turkish rule. Hunyadi sent the customary diplomatic appeals to the west by means of his intermediary János Vitéz; as usual, there was no response. The greatest achievement of John Hunyadi and John of Capistrano, unlikely allies that they were, was breaking through the ring of Turkish land forces, as well as the chains of Turkish flotillas that blocked access to the city, to effect a juncture with the city’s defenders. On July 21, having finally penetrated the outer defenses and moats, Mehmed gave orders for a final assault. In desperation, the sultan tried to arouse enthusiasm in his troops by joining the melée in person, only to be wounded in the thigh for his pains. Though the Turkish army had penetrated the city, it was unable to capture the fortress on the hill, defended by 16,000 men evenly divided between John of Capistrano’s crusaders and Hunyadi’s professionals. For Mehmed, who lost as many as 24,000 of his best soldiers and whose sailors colored the blue Danube red, it was a disastrous defeat. The relief of Belgrade was described as a “miracle” by Bernhard von Kraiburg, chancellor of the archbishop of Salzburg, in which “8,000 simple people” had defeated a vastly overwhelming Turkish force. In retreating toward Sofia, the ailing sultan was so angry that he wounded a number of his generals with his own sword and later had them executed. When the successful defense of Belgrade was reported to Rome, Eugenius IV called it “the happiest event of my life”; believing that a miracle had truly occurred, the pope made preparations for the beatification of John of Capistrano.